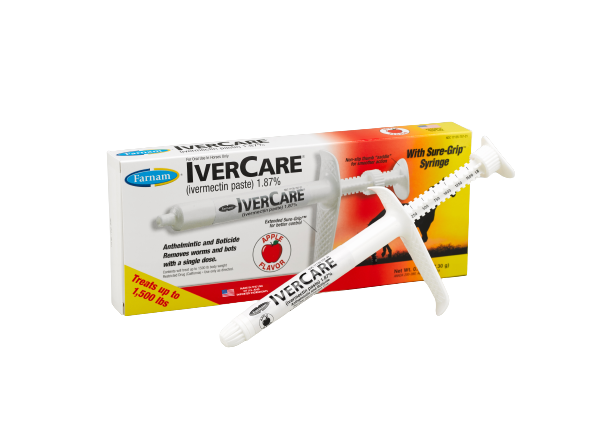 Remove worms and bots with a single dose of IverCare® (ivermectin paste) 1.87%. This convenient paste offers broad-spectrum parasite control and comes in the extended Sure-Grip™ syringe. Proudly made in the U.S.A., it's the only ivermectin product that treats horses up to 1,500 pounds in a single dose. This syringe contains sufficient paste to treat one 1,500 lb horse at the recommended dose rate of 91 mcg ivermectin per lb (200 mcg/kg) body weight. Each weight marking on the syringe plunger delivers enough paste to treat 250 lb body weight. Make sure that the horse's mouth contains no feed. Insert the syringe tip into the horse's mouth at the space between the teeth. Immediately raise the horse's head for a few seconds after dosing.